← Do you eat Oreos in Wigwams? Good morning Friends! Today I’m touching on a topic that requires constant attention in my household. I can practically hear the groans and moans of mothers right through my computer. 3) Actually keep up with the laundry. Option number one would probably not earn us many friends. And there is that whole hygenic thing. Option number two might earn us friends. Probably not the kind we want. On the other hand, it might send people running and screaming in shock. Still not quite the impression we want to make. Option three may be the most work but I’m thinking that it just might be a wee bit necessary. 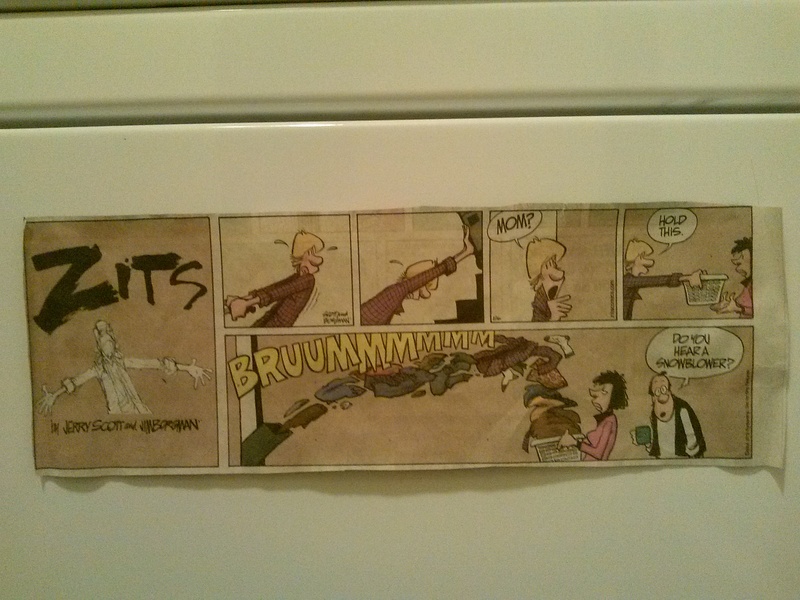 This is my dryer with the comic taped to it to make me laugh. One of the comments I get sometimes when people find out that I have five children is: “I can’t even keep up with laundry for my one (or two, or three, etc) child! How do you manage so much laundry? !” Well the truly honest answer is – sometimes better than others. But seriously, I do actually have a system, which is pretty normal. I also use homemade laundry detergent, which is a little unusual. Over the years I have tried several different detergents. Of course I wanted to be dye free and fragrance free for the babies when they were new. So the hubby’s old standby of Original Tide got tossed aside. We tried various brands of “Free” detergents and, being environmentally conscious, we also tried various brands of “ecologically friendly” detergents. Some were good, some not so good, but all were a little expensive when you consider the sheer volume that we use. So I toyed around with the homemade detergent. I think that after trying several options, from powdered detergent, to liquid concoctions, I have finally settled on one of the simplest, and cheapest options that seems to work extremely well for all of our needs. 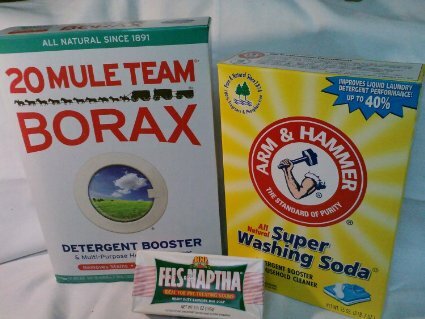 I use a simple mix of Borax, Washing Soda, and Fels Naptha soap. (Note: Washing Soda – not Baking Soda!) 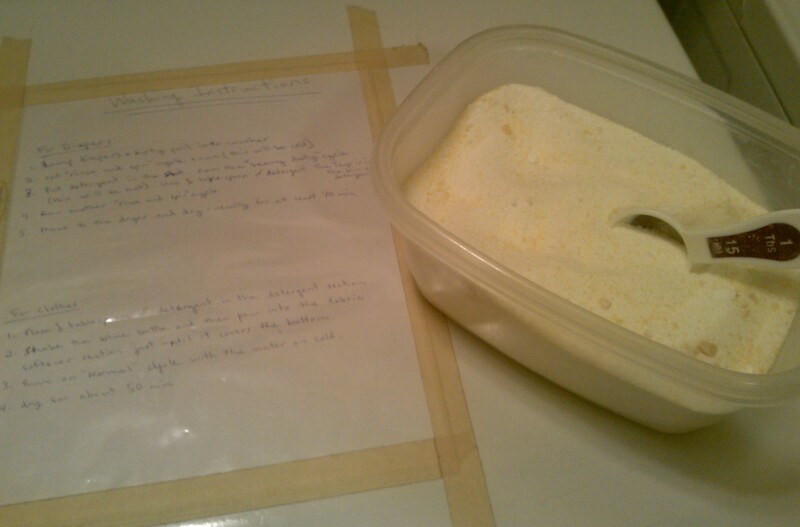 In a container I will combine 2 cups of Borax, 2 cups of Washing Soda, and 1 bar of finely grated/powdered Fels Naptha soap. I plunk a tablespoon into the container and we use no more that one tablespoon per load. 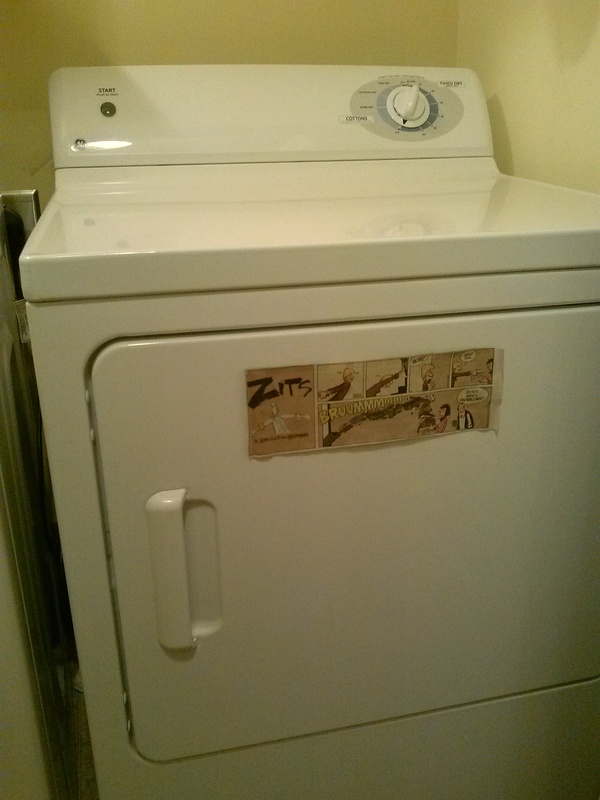 Here is our detergent – and yes, those are instructions on my washer so the children know how to help. This amount will last us at least 3 months, depending on how much we use. Mind you, we are washing clothes for 7 people, all of the cloth household products we use (such as cloth napkins, dish towels, rags, and wipes for hands and faces), and Mr G’s cloth diapers. A bar of Fels Naptha costs about $2. Borax is about $8 per box and Washing Soda is about $12. I usually go through 1 box of Borax and Washing Soda over the course of making 3 batches of detergent with the above recipe. When you break it down, that means that I am spending about $3 a month on detergent. And that is a very generous estimate. I figure that I am doing about 50 loads of laundry on any given month. That is calculating for the clothes being washed once a week per person with diaper loads being washed twice a week. I have increased that number by 2 loads per week to account for extra laundry like sheets, towels, and special loads due to extra messes. This is a rather ball park figure but with these numbers in mind I have calculated that a bottle of Tide Free would cost me about $0.20/load where my detergent will cost about $0.03/load. Nice savings! The verdict: Very clean clothes, easy on the earth, and no crazy residues or fragrances, and easy on the wallet! I really do find that we have very little staining (and I have 4 boys now! ), and even the diapers are clean and fresh. No odors are lingering and no left over suds are circling the washer. Those leftover soap residues can not only be hard on your clothes because they contribute to staining, but it is also a primary culprit in rashes for a cloth diapered baby. Not to mention it is not good for your washing machine. 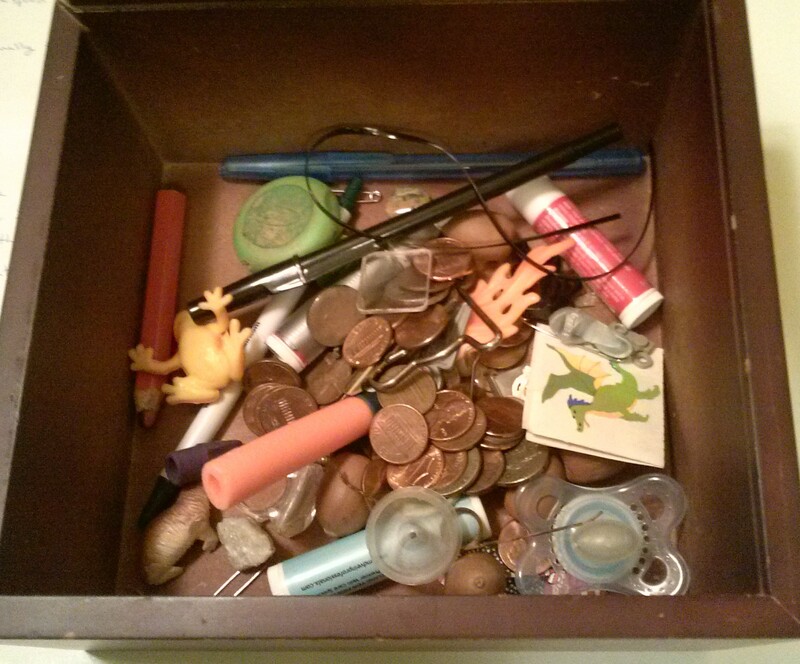 Anyone else have a collection like this from clothes pockets? Finely grate the bar of soap or run in through your food processor to get very small pieces or a fine powder. You want to have no large clumps of soap. Mix with the other ingredients. 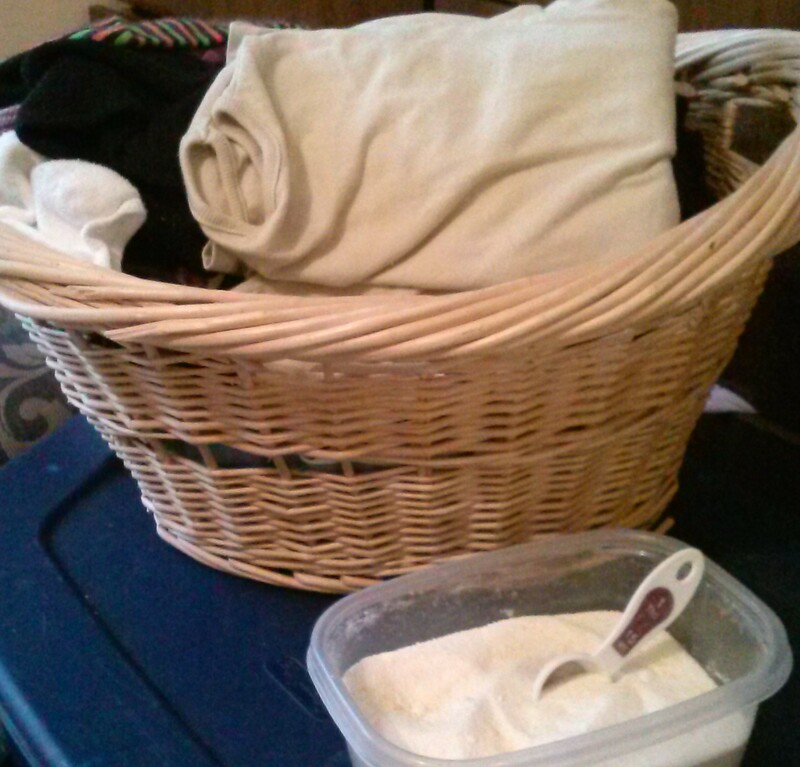 Use 1/2 to 1 Tablespoon for each load of laundry, depending on how soiled the items are. Smell your clothes after they are dry – no odor, no perfumes, just fresh! This entry was posted in Food and Recipes, frugal finds, home skills, Natural Living and tagged clothes, homemaking, laundry detergent recipe. Bookmark the permalink. Awesome! I cloth diaper and currently use some sort of “Bio….”, I forget the name – at $20 a box but it lasts 9 months. I was also considering using Dr. Bronners. I may try your recipe instead. I like this post. But thre are some battles I am not ready to fight.